SAMSUNG announces Galaxy Note 8 with 6.3-inch Infinity Display and S Pen. 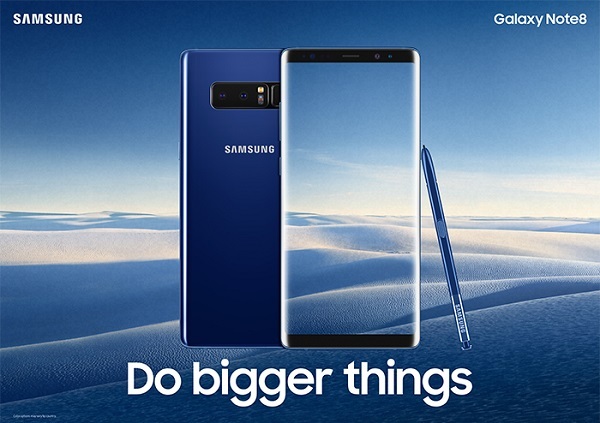 Samsung Electronics Co., Ltd. today introduces the Galaxy Note8, the next level Note with a bigger Infinity Display that fits comfortably in one hand, S Pen to communicate in more personal ways, and Samsung's best-ever smartphone camera to capture stunning photos. The Galaxy Note8 has the biggest screen ever on a Note device, yet its narrow body makes it comfortable to hold in one hand. The 6.3-inch Quad HD+ Super AMOLED Infinity Display lets you see more and scroll less. Note users have long been able to do more with Multi Window. With the Galaxy Note8, the new App Pair feature lets you create a custom pair of apps on the Edge Panel and simultaneously launch two apps with ease. Watch a video while messaging your friends or dial into a conference call with the number and agenda in front of you. Since its introduction, the S Pen has been one of the Note's defining features. With the Galaxy Note8, the enhanced S Pen unlocks entirely new ways to write, draw, and interact with the phone and communicate with friends. It has a finer tip, improved pressure sensitivity, and features that enable users to express themselves in ways that no other stylus or smartphone ever has. When communicating with text just isn't enough, Live Message allows you to reveal your unique personality and tell expressive stories. With the Galaxy Note8, you can now share animated texts or drawings across platforms that support animated GIFs. The Always On Display allows Galaxy users to stay on top of their notifications without unlocking their phone. And with the Galaxy Note8, it's even more powerful. Screen off memo allows you to take up to one-hundred pages of notes as soon as you remove the S Pen, pin notes to the Always On Display and make edits directly from the Always On Display. The Galaxy Note8 is the first smartphone with two 12MP rear cameras with Optical Image Stabilization (OIS) on both the wide-angle and telephoto lenses. For more advanced photo-taking, the Galaxy Note8's Live Focus feature lets you control the depth of field by allowing you to adjust the bokeh effect in preview mode and after you take the photo. In Dual Capture mode, both rear cameras take two pictures simultaneously and allow you to save both images; one close-up shot from the telephoto lens and one wide-angle shot that shows the entire background. The wide-angle lens has a Dual Pixel sensor with rapid Auto Focus, so you can capture sharper, clearer shots even in low-light environments. The Galaxy Note8 is also equipped with an industry-leading 8MP Smart Auto Focus front-facing camera for sharp selfies and video chats. Water and Dust Resistance: Four years ago, Samsung introduced the first Galaxy device with water resistance. And today, you can take your Note almost anywhere you want with water and dust resistance (IP685) on the device and the S Pen. You can write even when the display is wet. Fast Wireless Charging: Two years ago, Samsung introduced the first Galaxy device with wireless charging. The Galaxy Note8 supports the most advanced wireless charging capabilities yet, so you can get a quick, convenient charge6 without having to mess around with ports or wires. Security: The Galaxy Note8 offers a choice of biometric authentication options-including iris and fingerprint scanning. Samsung Knox provides defense-grade security at the hardware and software layers and with Secure Folder, keeps your personal and professional data separate. Powerful Performance: With 6GB RAM, a 10nm processor, and expandable memory (up to 256GB), you have the power you need to browse, stream, play games, and multitask. Innovative Mobile Experiences: Samsung DeX enables a desktop experience, powered by your phone. You can keep your files on your device, conduct work on the go, and use Samsung DeX when you need an even bigger screen. The Galaxy Note8 includes Bixby8, a smarter way to use your phone; it learns from you, improves over time, and helps you get more done. The Galaxy Note8 will be available starting in mid-September and will be offered in Midnight Black, Orchid Gray, Maple Gold and Deepsea Blue.